The ATC 800+ Temperature Control Unit is able to control the temperature of the surroundings it is in. This Temperature control unit is able to switch between both heat and cool temperatures. 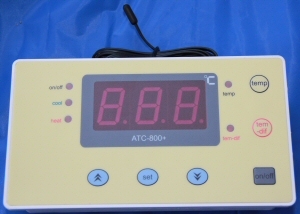 The ATC 800+ Temperature Control Unit is able to control the temperature by setting the temperature setting value and the difference value. To protect the temperature control if the temperature exceeds the set limits or a sensor error occurs then an alarm is alerted. These ATC 800+ units are very easy to install. Our loading is a lot greater than the unit's relay is designed to take so we use the switched circuits to trip a heavy duty relay that connects to our load (approx. 6kW). Service from Thermometers Direct was great.